Kevin Costner isn’t in great critical favor as a director these days, but he also seems to be one of the three or four best current directors of westerns (see the discussion of directors below). He’s probably underrated as an actor as well, since he’s turned in some strong work at this stage of his career in such non-westerns as The Upside of Anger. He directed and starred in Open Range, and he did very well in both those capacities. Boss Spearman and Charley Waite heading for the showdown. 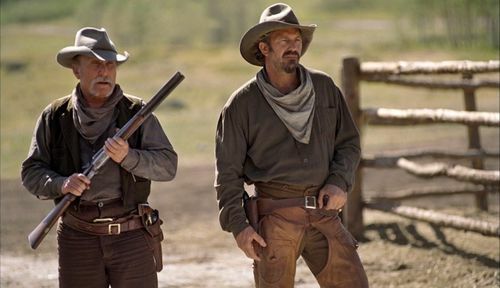 The story is a pretty typical cattle drive/range war sort of thing, in which Robert Duvall is Boss Spearman, a rancher moving his herd to market in 1882 with the help of Charley Waite (Kevin Costner) and a couple of others. At Harmonville, they run afoul of the entrenched local land baron Denton Baxter (played by the British actor Michael Gambon) and his minions, including a corrupt marshal (played by James Russo). These sorts of conflicts are never settled easily in a western. “Man’s got a right to protect his property and his life, and we ain’t lettin’ no rancher or his lawman take either.” Duvall is superb as usual, and Costner has enough heft and strength to play off him well. The Costner character seems a bit dour under the harsh circumstances (although less so than in Lawrence Kasdan’s Wyatt Earp), but he looks and plays as authentic. Even so, this might be ordinary enough were it not for two elements. The first is an excellent mature romance between Waite and Sue Barlow, the local doctor’s sister (Annette Bening)—mature because it’s between realistic people of a certain age, not because a lot of flesh or overt passion is shown. It is convincing, charming and seems true to the period. The second takes a while to develop, but the culminating shoot-out actually manages to seem more believable and real than most others in westerns. Note, however, Waite fanning his gun. It looks impressive and conveys a sense of familiarity with a gun, and perhaps expertise, but it was a notoriously inaccurate and often wasteful way of discharging a weapon, especially if you needed to save ammunition during an extended fight. Still, westerns have always been reluctant to show gunfighters reloading, since it slows down the action. The sound of guns firing in this film is loud enough to carry a shock with it (as with the punched-up sound of gunshots in Shane 50 years earlier), and that seems realistic, too. In the extreme situations that develop, Spearman and Waite each discover new things about the other. There seem to be real relationships here. Annette Bening as the doctor’s spinster sister Sue. Michael Gambon’s sheer malevolence as the land baron can seem a little over-the-top, and there’s a fair amount of scenery-chewing on his part. However, there is the gorgeous scenery of the Canadian Rockies as captured by cinematographer James Muro. This was the last movie made by veteran character actor Michael Jeter, who died soon after its release. Because of the violence, the movie is rated R.
This entry was posted in 55 Greatest Westerns and tagged Cattle Drives, Frontier Doctors, Kevin Costner, Robert Duvall on July 27, 2013 by Nicholas Chennault. 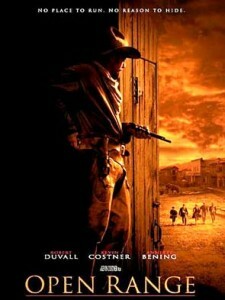 Open Range will always be my favorite western. It was perfect and I would never change a thing. HOWEVER, I always fantasize about a sequel,…..years later…Boss is Mayor and Saloon Owner, Matt and his sons buy Baxters place and add ranching to their freight business, Charley (now Town Marshall) and Sue get Married and have a boy and a girl and live in a nice house on an elevated spot on the edge of town as does Boss. There are no bad memories and the townsfolk take to Charley and Boss like family and are proud to have them in the community and feel safe and secure. Maybe too predictable but still a solid theme, turns out Baxter had a brother too and is hell bent on revenge and comes to Harmonville,……you’ll have to buy my book to find out the rest!